Sylvester Stallone may have caught flack for charging over 300 dollars an autograph at New York Comic Con 2013 (I'm sure he is crying into his hundreds as we speak), but that doesn't mean all iconic action stars are ready to follow suit. I'm hoping the future contains a lot more moments like these. Arnold Schwarzenegger took to Reddit to take requests for people's favorite movie lines, which he very seriously recreated and posted on YouTube. 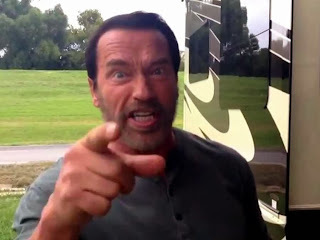 I'm not sure how many he's going to do as the bit isn't obviously marked over on Reddit, but the "If It Bleeds" clip is the first to hit...although it isn't the first quote Arnold has thrown at the interweb. I think I'm starting to love this guy again. We've included several more ArnoldTV bits...because it's Friday...and no one wants to really get work done today anyways.